Creepy new Nintendo toy or every girl's dream? Baby and Me for Nintendo Wii - slightly creepy or toy-making genius? 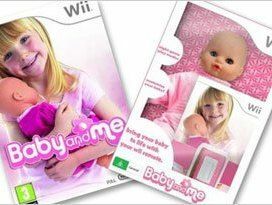 Every little girl loves to get the latest doll's and accessories at Christmas, and the Wii's latest is certainly due to be on a lot of lists to Santa next month – a Wii game called Baby and Me that lets kids interact with their toys in an entirely new way. Simply strap your Wiimote to your doll and the game will turn it into an all-new virtual playmate, letting you teach him or her to walk, to feed and more. The doll will also appear to cry, giggle or gurgle via the Wiimote's in-built speaker, adding to the overall sense of creepy wrong-ness! Plus, you can even use your Wii Fit Balance Board to rock your doll to sleep. The game will also quantify how good you are at teaching your pretend baby to do all of the above-mentioned activities. Adding an element of competitive play to many young girls' favourite pastime might seem a little wrong, but the publisher of this strange title might just have hit onto a hugely lucrative idea here.